Our bodies are designed to be physically active and not to sit behind an office desk, driving wheel or on the couch for the most part of the day. Recall that history class when your teacher was telling you about a life of a cave man. No doubts, everyday realities were harsh – men had to hunt or take care of a cattle, women were gathering or planting fruits and vegetables, doing all the house work without electricity, running water and many utensils of course… Put it simple, their survival required running, jumping, swimming, hiking, lifting, throwing, climbing, crawling DAILY! Using a modern language we can say that our ancestors were “in shape.” Doesn’t it sound ridiculous? To me it does, because they didn’t have much choice – they were either “in shape” or dead. The Nature Designed Us to Be Physically Active, but Our Modern Lifestyle is Designed for Us not to! In todays world things are different. Access to medical help and medications increases our chances for survival. 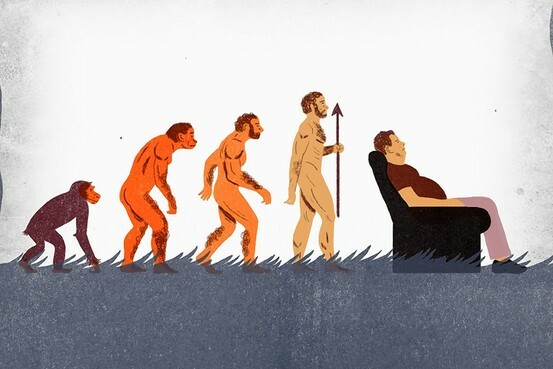 Civilization development allows many of us to have a very comfortable living, and the need for physical activity becomes smaller and smaller as technology takes over different parts of our lives. Despite all of these relatively recent changes, human physiology remains the same. A body still consists of 206 bones, approximately 640 skeletal muscles, the same organs and systems people had thousands of years ago. Therefore our very own nature designed this incredible mechanism – human body – to be practically used in every way. And if we neglect using one piece of that mechanism, the entire thing may fall apart! Literally! The Scary Statistics of Physical Inactivity. 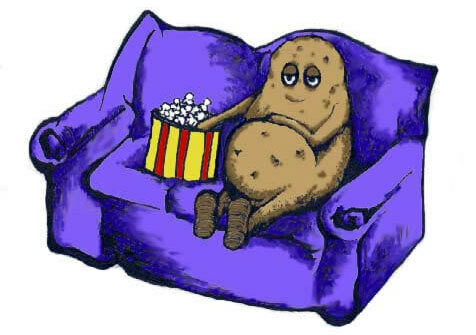 “Physical inactivity has been identified as the fourth leading risk factor for global mortality causing an estimated 3.2 million deaths globally,” according to World Health Organization1. 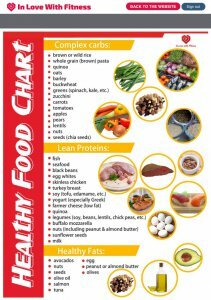 Being overweight or obese due to lack of physical activity and poor nutrition increases risk for diabetes, high blood pressure, high cholesterol, asthma, arthritis, and poor health status2. Ok-ok, I scared you enough! Government Guidelines for Physical Activity. The next question arises immediately – how much physical activity will be enough to minimize all these risks? 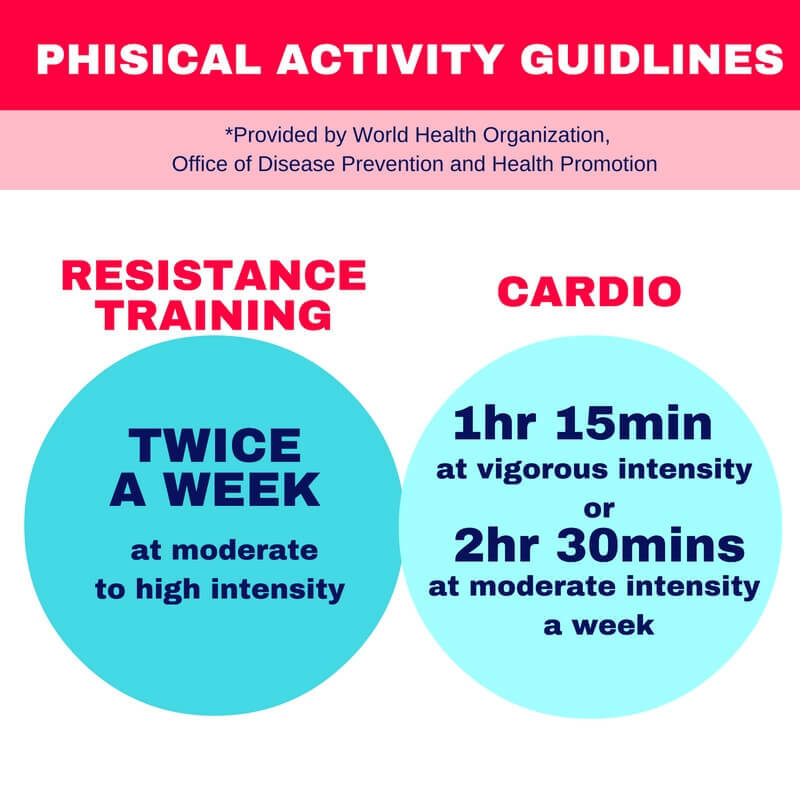 Office of Disease Prevention and Health Promotion as well as World Health Organization has developed “Physical Activity Guidelines” for different age groups. Adults aged 18-64 should do AT LEAST 150 minutes (2 hours and 30 minutes) a week of moderate-intensity, or 75 minutes (1 hour and 15 minutes) a week of vigorous-intensity aerobic physical activity3. In addition to that, adults should engage into moderate or high intensity resistance training for all major muscle groups AT LEAST twice a week3. As you see, these are just minimum requirements. If you are trying to gain more extensive health benefits, on a mission to loose significant amount of weight or simply want to look your best, expect to put in more time and efforts into your fitness. How Physically Active Are You? Take a 30-Sec Quiz! Answer these 3 simple questions. Be honest! Remember that your answers should describe your typical week. Are you physically active throughout your day or your lifestyle mostly sedentary? Now, if you answered “no” for the first 3 questions and your job requires you to sit behind the office desk for the most part the day, then YOU ARE NOT PHYSICALLY ACTIVE ENOUGH! This means you are not meeting the MINIMUM REQUIREMENTS the World Health Organization had set for an average adult. Get out of your safe bubble! 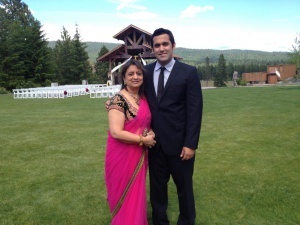 An occasional walk in the park or even a yoga once a week isn’t enough for an office worker! NOT ENOUGH! NOT ENOUGH! Period. You’ve got to fix it! Fix it before mother nature sends you signals because you aren’t going to be happy about them. Extra body fat won’t be the worst one on that list. How to Increase Your Physical Activity Level? Now, stop the panic. Let’s see what you can do right this moment because waiting till Monday isn’t the best strategy…You know that too well! Look at your weekly schedule and find three 1-hour long time spots. Now mark them as your “workout time”. Don’t have time? Really? Check your schedule again please. Keep it simple! 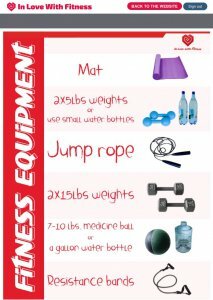 Don’t sign up for a gym, don’t purchase a “magic” machine, don’t wait for a friend to keep you a company… You don’t need any of this to begin an exercise routine! Start working out at home. 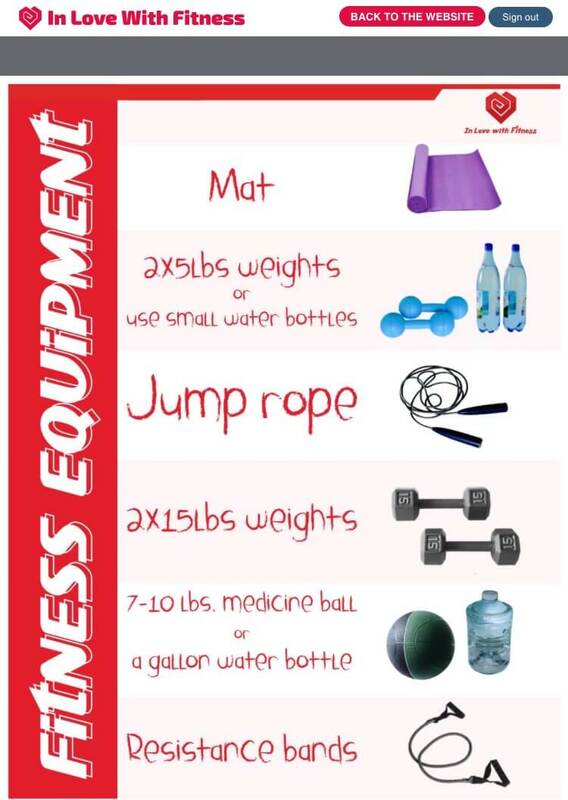 All you’ll need at the beginning is a mat (or big towel), 2 bottles of water (or small dumbbells), a gallon of water (to be used as a free weight). That’s it! Don’t Be Afraid of Being a Beginner! 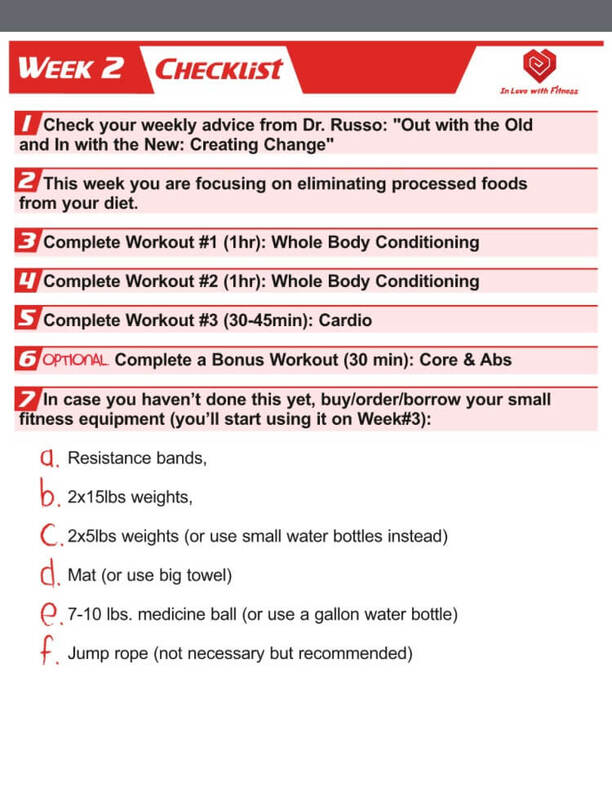 12-Week Beginners’ Fitness Program Will Guide You Every Step of the Way. How much cardio would be enough? What kind of resistance training can you do? 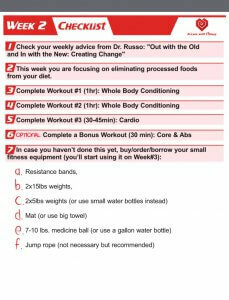 Detailed instructions for every week/workout/exercise…and much more! Our program is a great way to kick-start your fitness journey when you are short on time or a budget. Being fit & healthy shouldn’t be a luxury. It’s a necessity so we made it very affordable for every one. After all, I want to say that physical activity wasn’t and still isn’t a choice or a chore, it’s a part of our nature and physiological necessity to live a healthy well balanced life. Why Your Workouts Don’t Work Out? Find out why you are not loosing weight! 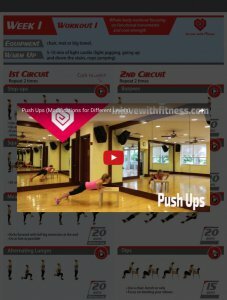 Why you are no longer see any results from your workouts? Learn how you can fix it and much more. I’m 62 and sometimes I surprise myself with what I can do at the gym. Finding the time to work out and to incorporate healthy eating does take some planning and commitment. But the results are well worth it. SO DO IT FOR YOURSELF. You deserve it.